In an attempt to relieve overcrowding at Arlington middle schools, most notably Williamsburg and Swanson, Arlington County has been considering a variety of revised school boundary options. The new school boundaries allocate students to the new middle school that will open in 2019 at the Stratford site. Students who will be affected by these changes are those currently in grades 4, 5 and 6. At the “What We Heard” meeting held at Yorktown HS on Wednesday October 25, APS staff presented drafts of only two refined options, A and B, that the county was considering before submitting their recommendations to the school board for their vote. The current middle school student population is 6,613 students, with roughly 1,300-1,400 students proposed to attend the new middle school. Their handouts noted that a majority of students will remain in their current middle school attendance zone and that more than 50 percent of students are in the potential walk zone for 4 schools. At-Large members: Terry Costello, David Gelman, David Haring, Elizabeth Kiker, Craig Mastangelo, Brian O’ Flaherty, Frank White. We are also soliciting members to sign up for “Executive Committee Member in Waiting.” As members leave the Executive Committee, these members would be appointed to join the Executive Committee. Members of the YCA can volunteer to be placed on the list at the December 13 meeting. Join us at our next YCA meeting: December 13 at 7:30 p.m. Each member of the YCA board is bringing cookies to share; extras will be given to residents who attend! It’s also our annual election. In September, more than 60 residents (a record!) attended the YCA meeting. Our main topic was teen drug use. Speakers included Captain David Giroux (ACPD First District Commander), Captain Tom Trumble (ACPD Drug Enforcement), Corporal Andrew Nucelli (Yorktown Schoool Resource Officer), and Ms. Mila Vascones-Gatski (Yorktown’s Substance Abuse Coordinator). An informative and eye-opening presentation was followed by a spirited Q&A. Captain Giroux asked the residents to help reduce teen drug use in Arlington. Residents should look out for drug paraphilia and suspicious activities. If you see something, say something. The Lee Highway Alliance (LHA) held a Board Meeting in September at their new office space at 4620 Lee Highway (Suite 208). The Arlington County Planning Department has interviewed candidates for County Planner who will lead the upcoming re-planning of the Lee corridor. The process will include a Community Forum (task force) with 40 members, and a working group of 8 participants, who will meet with staff and consultants to re-plan the corridor. The County has agreed that LHA, civic associations, and advisory groups will be represented on the task force. The process is likely to begin in early 2018.
needs. I encouraged the Board to focus on core emergency management functions of the Fire Station. I continue to engage with the business and property owners at Garden City Shopping Center to try to improve site conditions and better engage them. One idea being discussed is creating a Merchants’ Alliance. There are a number of issues common to both the businesses and the neighborhood, including trash removal, code enforcement, snow removal, and parking. The YCA Executive Committee is deciding if we should incorporate the Yorktown Civic Association as a 503c4. Incorporating will reduce personal liability for Executive Committee members and add clarity to the annual elections, finances, and record keeping. We plan to engage in a transparent process as we move forward, and bring information to the December meeting. Please join us! It has been a busy summer! We are continuing to track issues related to school capacity, high water bills, traffic and pedestrian safety, the Lee Highway Alliance, and the Garden City Shopping Center. I recently attended a meet-and greet session with the new Yorktown High School Principal Bridget Loft. YHS parents expressed their concerns about teen drug use and their perception that the Yorktown High School staff was not doing enough to address it. I met with Ms. Loft privately and expressed the community’s concerns about overcrowding at Yorktown High School, traffic and parking. We discussed how the common areas in Yorktown High School (gym, cafeteria, sports field, etc.) are significantly smaller than similar areas at Washington & Lee and Wakefield. Throughout the summer months, local homeowners continued to post replies on Nextdoor and Facebook related to unusually high water bills. Several homeowners wrote letters to Sun-Gazette editors, Arlington County Staff, and Board members. The Department of Environmental Services is refusing to conduct a thorough investigation into the unusually high water bills. Homeowners experiencing this should continue to contact DES and County Board Members and call for an independent audit of the water meters and water billing process. The Lee Highway Alliance (LHA) continues to make steady progress. LHA has a budget, leased office space, and an updated website. Google “Lee Highway Alliance” for more information. We have some improvements at the Garden City Shopping Center (GCSC), but we continue to see issues. The LHA, YCA Executive Committee, and the County Staff are working together to encourage property owners and tenants to form a Merchants Association. Ideally, the merchants will work together to improve trash/garbage removal, paving, sidewalks, landscaping, parking, and snow removal. The guest speaker for our next YCA general membership meeting will be Captain David Giroux. Captain Giroux was recently selected to be First District Police Captain. He will address teen drug use, traffic safety, and violence in our community. We need your help! We can match your passions, skills, and time constraints to the right “job.” Email me with “I want to help the YCA” in the subject line. Please get involved with the political process. You can’t move the ball forward if you are sitting on the sidelines. Stay engaged Arlington! Arlington County recently installed traffic control measures at two major intersections in the YCA. The committee tried an innovative approach in reaching out to county officials. The group met at the intersection of 26th and Harrison on a Friday at 3 p.m. just as YHS students were coming out. This proved persuasive, convincing officials that something needed to be done. The group also looked at the intersection of George Mason Drive and Yorktown. This site regularly sees minor accidents and close calls. This intersection also now has safety measures to protect pedestrians and realigned vehicle lanes. One member of the committee noted that, on his own, he had raised issues about the intersection near his house to no avail. When he linked up with others and worked through YCA, something positive happened. Nobody can guarantee such results every time, but there’s a lot of power in working together. The guest speaker for our next YCA general membership meeting will be Captain David Giroux. Captain Giroux was recently selected to be First District Police Captain. Chestnut Hills Park on North Harrison Street is about to undergo a major expansion and improvement, thanks to the just-completed demolition of two adjacent homes acquired by the County during the past 15 months. 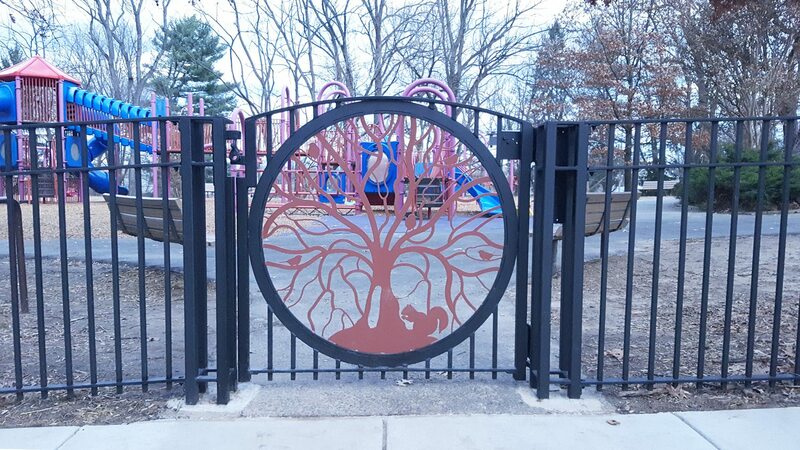 The parkland expansion will soon be complemented by a frontage improvement project that was sponsored by the Yorktown Civic Association and funded through the County’s Neighborhood Conservation program to install new entrances, fencing and pathways. The park expansion has been made possible through the use of funds from the County’s Park Land Acquisition program. The County acquired the first property in September 2015 for $728,000, and the second in March 2016 for $820,000. The County Board approved an additional $50,000 per property for deconstruction and site restoration. The addresses for the homes where 2827 and 2833 N. Harrison Street, respectively. The first of the homes was owned by long-time Civic Association Treasurer Bob Littell and his family. The combined size of the two lots is about one-half acre, but the removal of the homes opens up access to land behind those properties which was already owned by the County. Due to the recent loss of other open space in the County, the current intention is to simply maintain the additional property as open space parkland. For example, this expansion helps to offset the significant loss of green space on the Williamsburg school site with the construction of the new Discovery Elementary School. The frontage improvement project was actually funded back in December 2012, but implementation has been delayed twice – which has actually been a good thing! First, those improvements were postponed due to the 2014 playground renovations. Then, those improvements were delayed again when the first of the two homes was acquired in 2015. Those improvements have finally gone out to bid, and assuming that process goes well, a contract will go to the County Board for approval at its February 2017 meeting. The park improvements will include a new solid steel fence recessed 1’ behind the existing sidewalk; four recessed gates to provide stroller passing zones; a new enclosure and location for the portable restroom; pervious circulation pathways; and new benches and trash cans flanking the new walkways. The delay in this project ensures that the planned fencing and entrances will now include the recently acquired adjacent properties. The improvements are expected to take up to four months, and work is expected to begin fairly quickly after contract approval by the Board. It is expected that the Park will stay open during the work, although disruptions in access could be expected. The County has a dedicated web page for the improvement project at: https://projects.arlingtonva.us/projects/chestnut-hills-frontage/. This past summer I was fortunate to be able to provide a tour of Yorktown Civic Association to Harriet Edlesom, a Washington Post reporter. The goal of Harriet’s article was to learn about the different types of architecture that can be found within our association’s boundaries, see the mix of new homes and old, and to ascertain what characteristics draw families to our neighborhood? Don Purka, who along with his wife Christine, and two sons, moved here this past summer tells me that one of the reasons they choose to live within the boundaries of Yorktown Association was the feeling of a strong family and community feeling- almost like a throwback to the times when kids were able to run/bike to their friends’ homes without any parental worry. Don goes on to tell me that they could have chosen a large home, in a different Arlington neighborhood, but they put a priority on a neighborhood that they felt would be welcoming to their two boys- and after meeting with neighbors during their home buying process and confiding with other friends- felt Yorktown fit their needs perfectly. In addition, Don is able to walk to local bus stops to take public transportation to his job in the District. New construction can bring with it a myriad of problems to the neighborhood, most notably, road damage, parking issues, environmental concerns and added stress to our overcrowded schools. But these new homes also bring newer/higher quality homes and increase existing property values. The pros and cons of the razerebuild trend will continue to be debated in our neighborhood, but I feel the trend is, overall, a net positive. Finally, Don Purka’s sentiment resounds perfectly with me when he said that they chose Yorktown because they felt it was a community that was welcoming- a testament to each of you, its residents! The Yorktown Civic Association Executive Board (YCA EC) has been busy tracking local issues and communicating with key stakeholders. Issues related to high school boundary changes, unusually high water bills, dangerous intersections, street lights, Lee Highway revitalization, Garden City Shopping Center, and graffiti have filled my inbox the last full months. On October 27th, I sent a letter to the School Board stating the Yorktown Civic Association position on the high school boundary refinement proposal. In the letter, I stated that we were opposed increasing enrollment at Yorktown High School. I mentioned that the Yorktown High School building, common areas, gymnasium, athletic fields, parking lots, and the overall footprint were significantly smaller than Washington & Lee and Wakefield High Schools. We also felt that increasing the enrollment at Yorktown would have negative effects on parking and traffic in our neighborhood. Please go to the Yorktown Civic Association website (yorktowncivic.org) to view the letter. On December 1st, the School Board decided to refine the high school boundaries which will result in more students at Yorktown High School. For more information about the boundary changes, please go to the School Board website. Over the last few months, hundreds of local homeowners have complained on Nextdoor and Facebook about their unusually high water bills. Some water bills were three times higher than a similar period a year ago. Several residents contacted the Utility Service Office to complain about their high water bills. After receiving unsatisfactory responses from the head of the office, the residents contacted the county ombudsman (Robert Sharpe), and County Board members. The highest levels of the county government are now aware of this issue but, unfortunately, utility bills have yet to be adjusted. The Lee Highway Alliance (LHA) is now incorporated in Virginia as a non-profit 501(c)(4). The purpose of the Alliance is to [promote] revitalization and community development through civic engagement of the residential and business communities and interests along Lee Highway. I was selected as a board member and participated in the first official board meeting on January 7th. the next snow event and do your best to clear your sidewalks. If you, or someone you know, needs help shoveling snow, please post a request for help on Nextdoor Yorktown or on Facebook.